A sorcerer from Vinheim Dragon School. 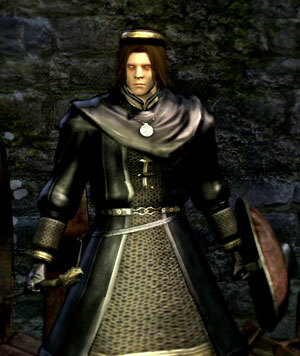 He came to Lordran in search of his master, Big Hat Logan, who has departed from Vinheim in his search for knowledge. In a locked room at the bottom of the Undead Burg. To reach the bottom the player can unlock the door (using the Residence Key) next to the dragon bridge, after the Taurus Demon boss battle. After climbing down the long ladder, keep going forward, descending the staircase where you might be attacked by two Undead Attack Dogs. After the staircase, make a U-turn to the right, then hug the left wall. You'll hear Griggs shouting for help when you're near the correct door. The door to Griggs is opened with the Residence Key. It cannot be unlocked with the Master Key, despite it unlocking several other doors that the Residence Key also unlocks. Unlock the door and go into the room and talk to (rescue) Griggs. Near the well just before the cliff path leading up to the Undead Burg. Upon buying all spells and rings from Griggs, when you return to the room where you pick up the Black Sorcerer Set, a hollowed Griggs will be there. This way you can get Griggs' drop without sinning. Sells basic Sorceries and Sorcery-related items only when your INT stat is at least 10 points. After Logan left to the Duke's Archives, he'll sell some of Logan's sorceries (Soul Spear and Homing Soulmass), effectively enabling you to get two copies of these two spells in one playthrough. Soul Spear 40,000 4 36 1 Fires large Soul Arrow that pierces its targets. Only after Big Hat Logan leaves Firelink Shrine. Homing Soulmass 20,000 10 18 1 Summons up to five soulmasses that fire automatically when an enemy is near. Only after Big Hat Logan leaves Firelink Shrine. Sorcerer's Catalyst 500 Basic catalyst needed to cast sorceries. Starting equipment of Sorcerer class. In the initial room where Griggs is trapped, is a body in a barrel on the right hand side with a Sorcerer Armor Set and Sorcerer's Catalyst. Be careful breaking the barrels in the room because you can hit Griggs and turn him hostile. Rolling (dodging) can be used to break scenery without hurting NPCs. The trigger for Griggs to sell Soul Spear and Homing Soulmass seems to be Big Hat Logan's departure from Firelink Shrine. So if you rescue Griggs after Logan left Firelink Shrine, or even after clearing Logan's quest in The Duke's Archives, Griggs will still sell the two sorceries. If Griggs' storyline is finished and he is killed in Sen's fortress, there is a possibility that he will appear in the first room where you initially meet him but, you will not be able to speak with him. Humanity can still be drained from him, however. There is also a possibility of Griggs appearing in the first room you find him in, with the same restrictions as mentioned above, if killed prematurely. Somebody! Please, let me out of here! Help me! Unlock the door! Brilliant! You opened the door for me! Thank you; Im am saved. I thought I might never escape. I am Griggs of Vinheim. A sorcerer of the school. I am much obliged for your assistance. Thanks to you, I may now resume my travels. I am fine. I will rest a while, then return to Firelink Shrine. I have my sorcery. And I will be more cautious next time. Besides, I have an important task at hand. I regret meeting you under such compromising circumstances. At least we both made it back unscathed. Incidentally, would you care to learn any sorceries? You're clearly talented, and besides, I owe you. Of course, we will require some materials, but I am happy to teach you some elementary spells. Are you interested? I am pleased to have a chance to give something back. Well, then let's get started straight away. Yes, I see… It is regrettable, but to each his own. If you change your mind, do not be bashful. Terrific to see us both in one piece. And prey that you never go hollow. Well you certainly are keeping at it. Lets get started straight away. …Well, it's really my own conceit, now isn't it? All right. That'll do it. That should help you on your journey. headed for the Catacombs, to seek Kindling. Kindling is the art of feeding bonfires. The poor young girl, sent down into a tomb. What a terrible mission she is burdened with. Oh, hello again! I was waiting to tell you… Master Logan has returned! And he tells me that he has you to thank! Well, we are both in your debt, now. Thank you, sincerely. He's just over there. Go along and have a chat. I appreciate the attention, but you really should speak to Master Logan. That will certainly do you more good. Time will tell, the annals of history will prove dispassionate. Master Logan has left on his own again. 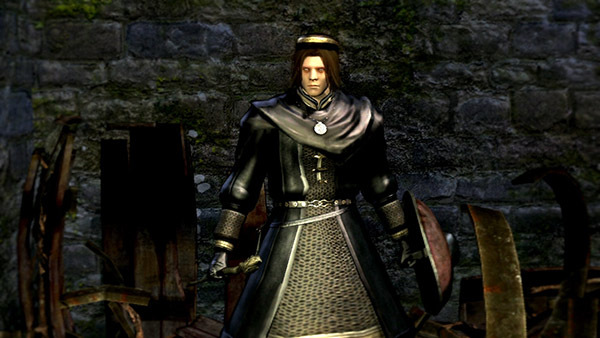 It seems that he is still determined to find the famed Regal Archives in Anor Londo. I intend to search for him. Only, before I leave, there is one thing I wish to do. You see, Master Logan has left most of his books. With them, I could teach you Logan's sorcery. … You have done much to assist me. Before I leave on this journey, I will teach you all that Logan has to share. Oh, hello, you made it! As promised, I shall bequeath Master Logan's sorcery to you. In the name of sanity! Cease! Have you gone mad? Curses, you leave me no choice! You aren't yourself any more.